At Shoe Clinic we have one very simple aim when fitting you in footwear - to "fit you in the very best footwear for your individual needs and characteristics". By running across the sensor pad of the Footscan Computer (an Adidas designed system), a digital print is produced of your foot as it lands. 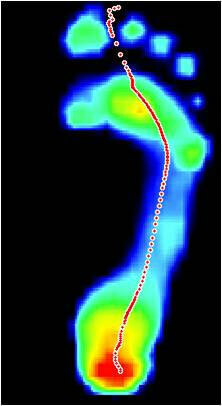 This indicates the anatomy of your foot, the pressure points and your biomechanical running style. Silicon Coach Treadmill video analysis is the process of filming human movement, importing the footage to a computer and then analysing performance using custom-designed computer software programmes. All of the service you receive at Shoe Clinic is free – you pay for nothing other than the price of the product you purchase. There is no rush, your Shoe Clinic Technician will not only spend as much time with you as required, they will measure your feet, give you a complimentary bottle of water, talk you through everything clearly & join you to ourAdvantage Club loyalty programme. Don’t take just our word on this, Shoe Clinic is a Consumer Trusted Business & also won the Canstar 2014 Most Satisfied Customers Award - Sports Footwear Retailers. We have also been recognized by Podiatry NZ and made a Platinum member. Through our relationship with Podiatry NZ, in many of our stores, we offer a complimentary in-store service, where you can see a podiatrist to discuss any injuries or concerns you may have. This is appointment based, so contact your local Shoe Clinic store for more details. The two directors of Shoe Clinic Franchises Ltd (who also run the Wellington and Lower Hutt stores) bring a wide range of experience in the sports industry to their roles. Managing director Neville McAlister (right) has run his own sport stores for the past 27 years. He retired as an NPC rugby referee in 2003. 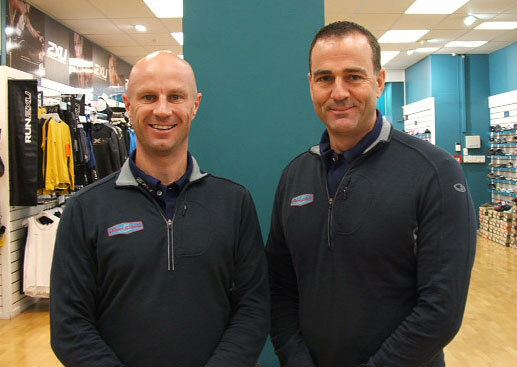 Footwear manager Hamish French (left) moved to the retail side of the sports industry in 1996, following a career in sales and marketing with both Reebok and Nike. Are you interested in a Shoe Clinic franchise opportunity? Operating a Shoe Clinic needs energy, enthusiasm and commitment. Shoes Clinic stores have a substantially higher than average customer conversion rate because at every franchise all the staff are highly trained in shoe technology and superior customer service. That includes extensive training for the franchise owner/manager within each store. If you think you've got what it takes to run a Shoe Clinic store, contact us. When purchasing from Shoe Clinic, you are also supporting your local community. Shoe Clinic donates returned footwear from our 30 Day Money Back Guarantee programme to local charities. As Tric Malcolm, the Wellington City Missioner, says “Shoe Clinic’s generosity has seen many people in our community get into quality shoes that they would never normally have access to”. This combined with sponsorships in numerous local events is something that Shoe Clinic takes great pride in! Our Back to School Rewards programme is also a huge hit with local schools. Every pair of school shoes purchased sees $10 go back to the student's school. Simply just let the Shoe Clinic staff know your school when making your shoe purchase. Every pair of school shoes also comes with a free New Balance backpack.